After few months in technical preview stage, Microsoft has finally updated its second version of Microsoft Security Essentials (MSE) from to final version. Microsoft Security Essentials is a free anti-virus and anti-spyware solution that provides protection against different types of malware such as computer virus, spyware, rootkits and trojan horses for . This released has been included lot of features and enhancements such as heuristic scan engine, network intrusion detection, integrated Windows firewall management and etc. to improve security protection for computer. Network inspection system – Protection against network-based exploits is now built in to Microsoft Security Essentials. 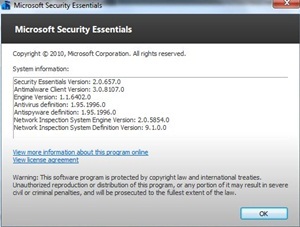 Microsoft Security Essentials supports Windows 7, Windows Vista, Windows XP, and reportedly can also be installed on Windows Server 2008 and Windows Server 2008 R2.